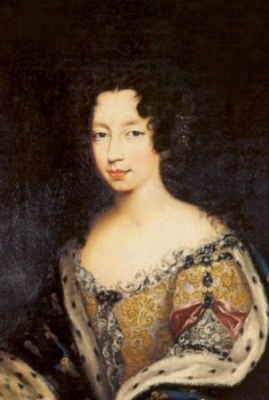 Charlotte von der Pfalz was born on 19 December 1628. She was the daughter of Friedrich V von der Pfalz, King of Bohemia and Elizabeth Stuart, Princess of England.1 She died on 14 January 1631 at age 2. Her married name became Hyde. After her marriage, Frances Aylesbury was styled as Baroness Hyde of Hindon on 3 November 1660. After her marriage, Frances Aylesbury was styled as Countess of Clarendon on 20 April 1661. [S15] George Edward Cokayne, editor, The Complete Baronetage, 5 volumes (no date (c. 1900); reprint, Gloucester, U.K.: Alan Sutton Publishing, 1983), volume II, page 11. Hereinafter cited as The Complete Baronetage. [S6] G.E. Cokayne; with Vicary Gibbs, H.A. Doubleday, Geoffrey H. White, Duncan Warrand and Lord Howard de Walden, editors, The Complete Peerage of England, Scotland, Ireland, Great Britain and the United Kingdom, Extant, Extinct or Dormant, new ed., 13 volumes in 14 (1910-1959; reprint in 6 volumes, Gloucester, U.K.: Alan Sutton Publishing, 2000), volume III, page 265. Hereinafter cited as The Complete Peerage. [S22] Sir Bernard Burke, C.B. LL.D., A Genealogical History of the Dormant, Abeyant, Forfeited, and Extinct Peerages of the British Empire, new edition (1883; reprint, Baltimore, Maryland: Genealogical Publishing Company, 1978), page 295. Hereinafter cited as Burkes Extinct Peerage. [S6] Cokayne, and others, The Complete Peerage, volume III, page 266. 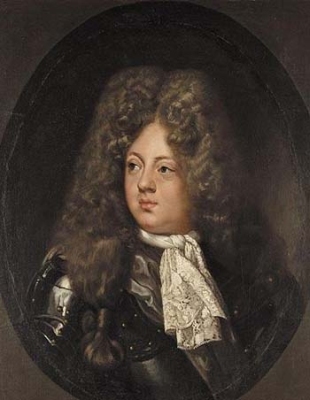 Friedrich August Hanover, Prince of Hanover was born on 3 October 1661 at Hannover, Niedersachsen, GermanyG.2 He was the son of Ernst August I Kurfürst von Hannover and Sophie Dorothea Prinzessin von der Pfalz. 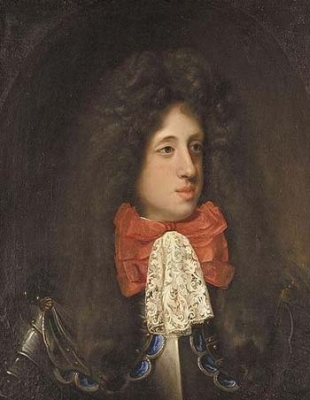 He died on 31 December 1690 at age 29 at St. Georgen, Siebenbürgen, Transylvania, killed in action.2 He was also reported to have died on 10 January 1691 at St. Georgen, TransylvaniaG. 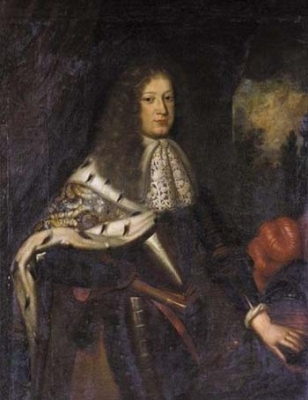 Field Marshal Maximilian Wilhelm Hanover was born on 13 December 1666 at Schloss Iburg, Hannover, Niedersachsen, GermanyG.2 He was the son of Ernst August I Kurfürst von Hannover and Sophie Dorothea Prinzessin von der Pfalz. He died on 16 July 1726 at age 59 at Vienna, AustriaG.2 He was also reported to have died on 27 July 1726 at Vienna, AustriaG. [S11] Alison Weir, Britain's Royal Families, page 274. He matriculated at Magdalen Hall, Oxford University, Oxford, Oxfordshire, EnglandG, on 31 January 1622/23.1 He graduated from Magdalen College, Oxford University, Oxford, Oxfordshire, EnglandG, on 14 February 1625/26.1 He was admitted to Middle Temple on 22 November 1633 entitled to practise as a barrister.1 He was Keeper of the writs of the Common Pleas in 1634.1 He held the office of Member of Parliament (M.P.) for Wootton Bassett in 1640.1 He was appointed Privy Counsellor (P.C.) 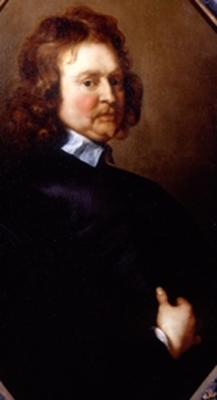 on 22 February 1642/43.1 He held the office of Chancellor and Under Treasurer of the Exchequer from March 1642/43 to June 1660.1 He held the office of Councillor to the Prince of Wales between 1644 and 1649.1 He held the office of Ambassador to Spain between 1649 and 1651, jointly.6 He held the office of Secretary of State between 1653 and 1657.6 He held the office of Lord High Chancellor between January 1657/58 and August 1667.6 He held the office of High Steward of Cambridge between 1660 and 1670.6 He held the office of First Commissioner of the Treasury between June 1660 and September 1660.6 He held the office of Chancellor of Oxford University from 22 October 1660 to 1667.6 He was created 1st Baron Hyde of Hindon, co. Wilts [England] on 3 November 1660, with a Royal gift of £20,000.6 He held the office of Ranger of Whichwood Forest in 1661.5 He held the office of High Steward of Norwich Cathedral between 1661 and 1670.5 He held the office of High Steward of Yarmouth between 1661 and 1674.5 He was created 1st Viscount Cornbury, co. Oxford [England] on 20 April 1661.6 He was created 1st Earl of Clarendon [England] on 20 April 1661.6 He held the office of High Steward of Salisbury on 4 October 1662.5 He held the office of Lord-Lieutenant of Oxfordshire between 1663 and 1667.5 He was appointed Knight on 22 February 1662/63.1 He was appointed Fellow, Royal Society (F.R.S.) 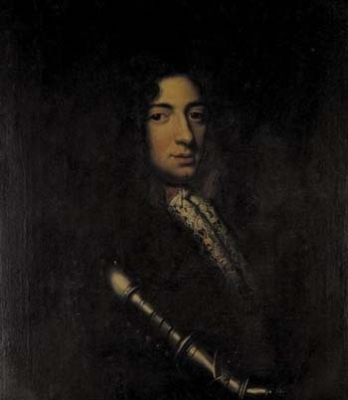 on 8 February 1664/65.5 He held the office of Lord High Steward on 12 April 1666, for the trial of Lord Morley.5 He held the office of High Steward of Woodstock in 1667.5 He held the office of Lord-Lieutenant of Wiltshire between June 1667 and November 1667.5 On 30 August 1667 the Great Seal was removed from him, after he refused to give it up.5 In October 1667 a bill was passed in the House of Commons to impeach him, but it failed.5 On 29 November 1667 he left England to avoid persecution.5 His last will was dated from 1 December 1674 to 11 December 1674. [S6] Cokayne, and others, The Complete Peerage, volume III, page 265. [S6] Cokayne, and others, The Complete Peerage, volume III, page 264.